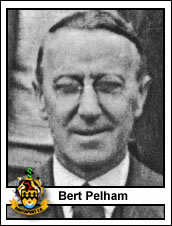 Bertram Pelham was the Secretary of New Brighton when they joined the Football League in 1923; in August 1927 he was appointed their Secretary-Manager and he held this position until assuming the same role at Southport in April 1931. Almost immediately Southport won the Liverpool Senior Cup for the first time and in his first full season Mr Pelham took the club to the fourth round of the F.A. Cup; they lost to the eventual winners Newcastle United after two replays. In 1932-33 he made a number of signings which it was hoped would lead Southport to a strong promotion bid but despite a good start the club’s performances slumped and he was dismissed in March 1933. During the war, when he was engaged on food control, he returned to Haig Avenue as Honorary Manager. He held this position from September 1940 until Gordon Hunt was reinstated in October 1945. He retained his interest in the club and was put in charge of the Vice President’s room in 1967, following the rebuilding of the grandstand. He died in his 93rd year on April 1st, 1977.